As we mentioned last week in a post on the benefits of infant massage, this special activity with baby can be a great bonding tool with myriad benefits to both babies and their caregivers. While no special training is required to offer healthy touch to a baby, here is some additional information on how to give infant massage. For young babies, it can be ideal to offer a massage when your baby is in a quiet yet alert state. You may want to avoid the time just after a feeding or when baby is sleepy. Lay a soft towel or blanket on the bed or floor where you will offer the massage. You may also wish to sit on the floor (or bed) with the soles of your feet together and knees apart, forming a diamond shape with your legs. Drape the blanket over your feet and between your knees. Undress baby down to the diaper and place him or her on the blanket, head toward your feet, facing you. You can use massage oil in a non-breakable container. Almond oil or coconut oil work well for many babies, but you may wish to test the oil on a small spot on baby’s skin and wait a day to ensure they aren’t irritated by the oil. Start with a gentle stroke from baby’s head to toes. If baby stiffens up, cries, or becomes irritable, switch to another area of the body or end the massage for time being. If s/he responds well, start gently massaging his/her body. Here are some techniques for each body area. Note: their is not one particular “right” order of body areas to massage. You may choose to work from trunk to extremities, or the opposite, or massage in any order that feels right. Hold your hands palms toward you, fingers pointing in (wrists bent), so the edge of your pinky can move across your baby’s belly. Starting at the base of the rib cage, stroke down with one hand, then the other, continuing one after the other. Massage her belly with your fingertips in a circular, clockwise motion. Do the “I Love U” stroke: Trace the letter I down your baby’s left side. Then trace an inverted L, moving across the belly along the base of her ribs from your left to right and then down. Trace an inverted U, stroking from low on the baby’s right side (your left), up and around the navel, and down the left side (your right). Walk your fingers around baby’s navel, clockwise. Hold baby’s knees and feet together and gently press knees up toward the belly. Rotate baby’s hips around a couple times to the right. (Great for expelling gas. Note: Avoid massaging tummy if the umbilical cord site hasn’t completely healed. Massage her ears between your thumb and index finger. Trace a heart shape on baby’s face, bringing your hands together at his/her chin. Place your thumbs between your baby’s eyebrows, and stroke outward. Stroke from the bridge of the nose out over the cheeks. Using your fingertips, massage the jaw hinge in small circles. Place both hands on baby’s chest and stroke outward from sternum to shoulders. Beginning at the sternum, trace a heart shape bringing both hands up to the shoulders, then down and back together. In a crisscross pattern, stroke diagonally from one side of your baby’s hip, up and over the opposite shoulder, and back down to her hip. With each hand grasping her arm, one right above the other, stroke down from shoulder to wrist with both hands rotating in opposite directions, as if you were gently wringing out a towel. Massage baby’s palms, moving thumb over thumb from heel of the hand to the fingers. Stroke down from the wrist to fingertips on the back or front of the hand. Gently squeeze and pull each finger. Roll her arm between both your hands. Hold the ankle with one hand and hold your other hand in a C-shape, thumb down, around your baby’s upper thigh. Stroke from thigh down to foot, skipping over the knee joint. With your hands grasping the leg at the thigh, one right above the other, stroke down from hip to foot with both hands rotating in opposite directions, as if you were wringing out a towel. On the sole of her foot, use a thumb-over-thumb motion to massage from heel to toes. Use your whole hand to stroke the bottom of the foot from heel to toes. Stroke the top of the foot. Gently squeeze and pull each toe. Roll each leg between your hands, as if you’re rolling dough. Place baby on tummy horizontally in front of you, or lay baby across your outstretched legs. Keep baby’s hands in front of him/her, not at the sides. With both of your hands on baby’s back, move each hand back and forth (keeping them going in opposite directions) from the base of the neck to her buttocks. Hold your baby’s bottom with one hand and use the other to make long strokes from the neck down to the bottom. 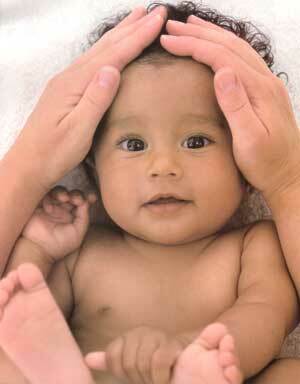 Using your fingertips, massage in small circles down one side of baby’s spine and up the other. Avoid pressing on the spine directly. Massage the shoulders with small circular motions. Massage the bottom with big circular motions. Holding your fingers like a rake, stroke down her back. Make strokes gentle but firm, and not ticklish. Build massage into your baby’s daily schedule. Follow baby’s signals about when to stop. A massage can last anywhere from a few minutes to as much as 30 minutes, depending on baby’s moods. Enjoy this precious time with your beloved little one. « Five reasons to massage your baby!